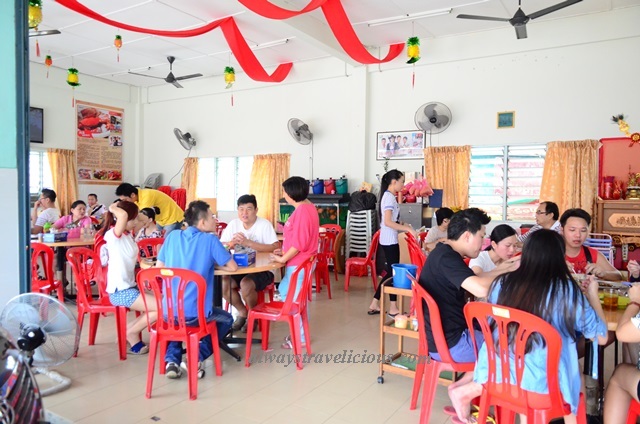 Bagan Seafood Restaurant @ Sekinchan, Malaysia - Always Travelicious ! Bagan Seafood Restaurant (鸿运海鲜饭店) seems to be a popular one at Sekinchan along the seafood street where about 10 restaurants compete. At off peak hours of 3 – 4 pm, patrons were still flowing in yet somehow, our experience was just an average one. We ordered three dishes – 1. Razor clam in kam heong sauce (RM 17) is aromatic with curry-flavor but I think the clams were blanched in water first then stir fried with the sauce, making them a tad watery so the sauce didn’t adhere as strongly and felt slightly diluted. 2. This “Half Way to Cook Fried Tongus Fish” (RM 14) as per menu is pretty much translated literally from its Chinese name – 半煎煮龙舌. The staff explained it’s a one sided fish also known as “slipper fish” – so I am thinking it’s some kind of flounder, but about half the size than the ones that you would see in a Japanese restaurant. This dish is well executed, where flounder pieces are fried till crisp and blanked with an appetizing fermented bean sauce while ginger and leeks enhanced the flavor. The steamed prawns (RM 16) looked good immersed in solid egg white topped with ginger slices and deep-fried onion. Unfortunately the prawns were not too fresh with an overpowering use of rice wine. The prawns could have been better. But the three dishes only came up to RM 47 – not even RM 50 for seafood, so maybe this could be the reason that it’s popular. Address: No.168-C, Lorong 5, Jalan Bagan, 45400 Sekinchan, Selangor, Malaysia. I agree, quite a bargain for all that seafood. I don’t think it’s possible to get the same deal anywhere else.